I’ve wanted a tattoo for as long as I can remember. Not a sleeve covering an entire arm or multiple images inked onto various parts of my body; just a single piece of art on a discreet area of skin. A tattoo with a video game reference which subtlety displays my love for the adventure genre without being too over-the-top. Nothing like Jack from Mass Effect. If I was brave enough, what would I go for? Here are some of the best and worst I’ve managed to find across the internet, along with a few which may manage to convince me to get inked. The gorgeous LightningEllen from LightningEllen’s Release and lovely Nathan from Hurricane thought process are the proud owners of the first two tattoos above – you can read more about their inky experiences by clicking on those links. It’s artwork like this, and as shown in the other images in this section, that make me want to pluck up the courage to go under the needle myself. No… just no. It’s tattoos like this which put me off the whole idea and not want to bring a needle anywhere near my skin. I understand body art is a very personal thing and means something to the owner that others may just not get; but some of these are so badly designed or poorly drawn, and I feel sorry for these people who are going to be marked for the rest of their lives. It’s probably no surprise to most reading this that I’ve included a few Monkey-Island-inspired works here! I really like the one of Murray; it’s definitely something I could see myself opting for because it’s subtle and he’s such a great character. The last isn’t a tattoo but an absolutely beautiful image by vapidity on DeviantArt, but it would make a great piece of body art. I’ve always wanted a tattoo, but I’ve never known what to get. Not sure I’d get a video game tattoo though, really can’t think of one I’d get. 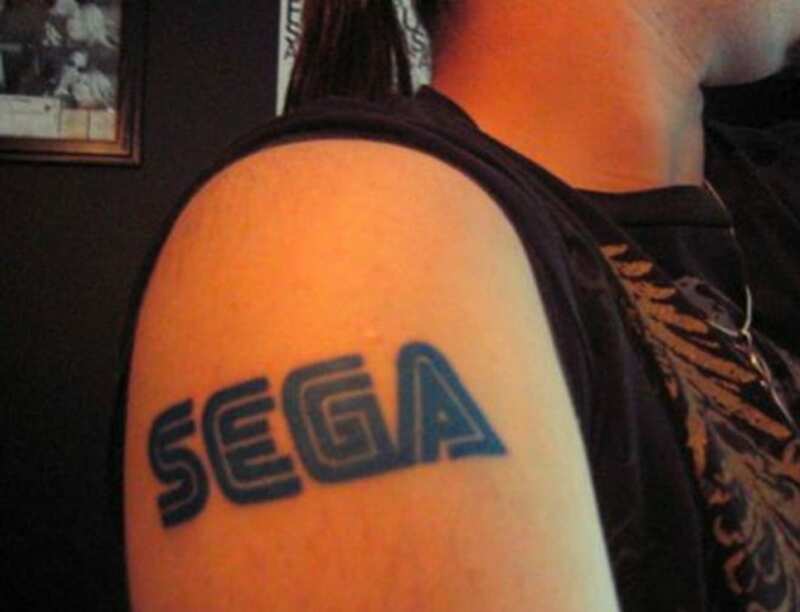 Maybe a SEGA logo? That’s actually pretty awesome, maybe a smaller version might work! Nah – I only have enough money for the weekly shop. I’ll get killed if I return home with no food and a shiny blue Sega tattoo! Love the 3 headed monkey one! My top tips for ending up with a great tattoo are A: don’t make it small just because it seems less scary, a lot of people regret getting really small tattoos eventually because often slightly bigger ones look better in the space. B: Thoroughly research your artist, make sure that not only do they do the type of thing you want, but also that you like them! Might sound obvious but if you’re comfortable with them you’ll be less nervous! My first tattoo was something from Final Fantasy VII, still love it now! This has reminded me of some ideas I’d been planning, I really must try and save up enough cash for them! I’ve asked several people and the answers I’ve been given about pain are so varied – from ‘it’s a slight scratch’ to ‘it’s painful but I enjoy it’. If only there was a way to test how it felt without committing to entire tattoo first! When I went for my first one the artist took a few seconds to do a ‘dry run’ to see how I reacted, so you might be able to get something like that. Totally with you on this, I’ve been trying to pluck up the courage for 20 years. I didn’t rebel as a teenager, so I missed out! My wife has several tattoos from her teens, just because she could. It would either be that, or Vault Boy from Fallout. Some pixel art would make a really cool tattoo though! I’ve always wanted the Bioshock “chain” one, but I don’t think my wife would be happy about it! The Guybrush one is brilliant, but I think it would become less well defined over time. Didn’t think of that; very good point. Maybe something with less sharp edges would be better… I have to say I’m pretty tempted by a Murray the skull. So long as it’s clear who it is rather than just looking like a generic skull. I can see why I shouldn’t have one really, I’d probably overthink what I’m getting and never get one anyway! Thanks for featuring my ink! I took my time and did lots of research into tattoos and artists before taking the plunge. I recommend anyone interested in getting a tattoo think about it very carefully. The artist you choose is kind of a big deal, haha. I have a fear of getting any piercings (my ears aren’t even) but I have no issues with getting inked, apparently. 😛 The tattoo process feels like a sunburn in most areas, but I wanted to scream a bit during the tricep parts on mine, not gonna lie. Later this year, once I’ve slimmed down some more, I’m having this done in black on my back, not just because of my love for the series but also because the symbols in it have ad deeper meaning for me. I’ll record it, that way, if you ever need some audio of someone swearing like a sailor in two languages, you’ll have something perfect for the occasion. One thing though, is that some people have told me that the outlining hurt most and others have told me coloring hurt most. I believed that coloring wouldn’t hurt as much but man was I wrong. Oh no… was it really painful? Damn myself for being such a wimp ha ha ha! It wasn’t too painful! It wasn’t painful enough to stop me from wanting more haha. Everyone seems to be encouraging you to get one and I think so too! My friend who has been to multiple tattoo artists said that usually female tattooists have a more gentle hand, so maybe you can take that into consideration too! Oh really? I’d never heard that before but it sounds like good advice, so thank you!